The AMW (ATLAS Model Weaver) project is a GMT component developed by the ATLAS group, INRIA. AMW is part of the AMMA platform. The Atlas Model Weaver supports the creation of different kinds of links between model (or metamodel) elements. The links are saved in a weaving model. The weaving model conforms to an extensible weaving metamodel. Weaving models can be used in different application scenarios, such as tool interoperability, transformation specification, traceability, model merging, model comparison. The AMW is developed based on a core weaving metamodel. This core metamodel supports basic link management, i.e., n:n relationships between model elements. The identifiers of the referred elements can be saved using different identification methods. The core weaving metamodel is illustrated below. WElement is the base element from which all other elements inherit. It has a name and a description. WModel represents the root element that contains all model elements. WLink denotes the link type. WLink has a reference end to associate it with a set of link endpoints (WLinkEnd). Each WLinkEnd references one WElementRef. The attribute ref contains the identifier of the linked elements. WElementRef is not referenced directly by WLink because it is possible to reference the same model element by different link endpoints, for example one model element may participate in more than one mapping expression. 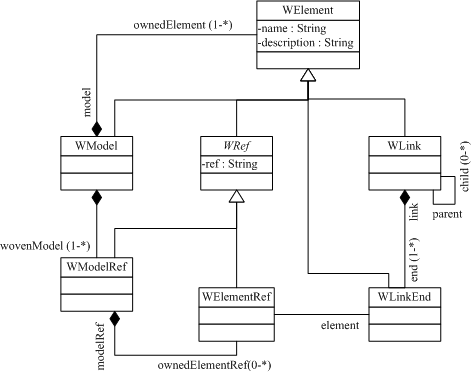 WModelRef is similar to WElementRef, but it contains references to the models. The different kind of semantics of a weaving metamodel are defined in extensions to the core weaving metamodel. The different weaving metamodel extensions can be applied in different application scenarios. They are available for download in the Weaving metamodel Zoo. The use cases section provides complete scenarios that use these metamodel extensions. The AMW FAQ explains how to create weaving metamodel extensions. The AMW prototype is developed as an Eclipse plug-in. It uses EMF as base model handler. The prototype is a generic workbench for weaving models. It provides a set of extension points definition to enable to customize the interface according to different metamodel extensions. An example of the interface is shown below. The first contribution to the AMW interface is the base weaver extension plugin (org.eclipse.weaver.extension). This extension enables to use the AMW plugin with the basic functionalities. This extension is provided for download together with the core weaver plugin (org.eclipse.weaver). The AMW plugin is used to manually create weaving models. However, it is possible to semi-automatically generate these models. Weaving models are generated using matching transformations. Matching transformations are transformations that execute matching heuristics to create a set of links based on a similarity value. This value can be calculated in different ways, for example by using the edit distance between two strings, or by using the structural relationships (e.g., containment, inheritance) between model elements. The AMW plug-in is integrated with ATL to be able to execute matching transformations directly from the main user interface. 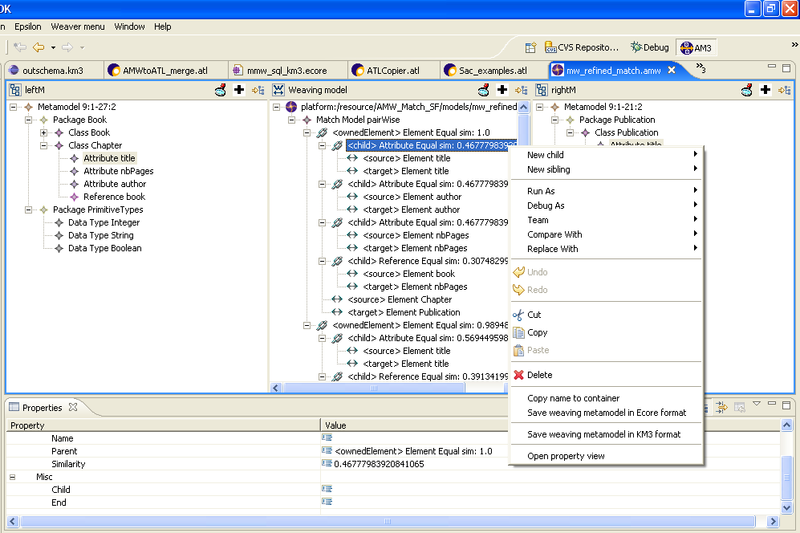 The matching transformations are implemented in the org.eclipse.weaver.transformation plug-in. These transformations are also available separately in the Matching transformation library. The AMW Model Handler enables a better integration of ATL transformations and weaving models. It provides a set of primitives constantly needed when developing transformations that have weaving models as input or output. The AMW Model Handler page contains detailed information on how to download, to install, and to use the new primitives. The Atlas Model Weaver has a new plug-in extension that enables to graphically develop simple ATL transformations. This extension enables to create simple ATL transformations using the graphical interface of AMW. This extension does not intend to support all the features of the ATL metamodel. It is a first step to rapidly develop ATL transformations. The plug-in is available at the Download section, in the deployment build. The plug-in name is "org.eclipse.gmt.weaver.qatl". It contains the weaving metamodel extension, the sources, and an illustrative example. We explain below how to use this extension. First it is necessary to create a weaving model using the AMW wizard (this is explained in details in the User Guide). In the first page of the wizard, select the metamodels/mmw_qalt.km3 extension. In the second page, select a name for the weaving model. In the third page, add two new metamodels (Add model button), one for the input and other for the output. The input model must be associated with the InModelRef, and the output model with the OutModelRef. After that, a weaving model only with a Module element is created. The user must use the context menu (right-click) to create the weaving elements. The prototype proposes the valid elements, such as rules, input and output elements, bindings. An example of weaving model is shown in the Figure below. It is necessary to set the name to the Module. For the other elements, the name is generated automatically. However, it is advisable to use user defined names. 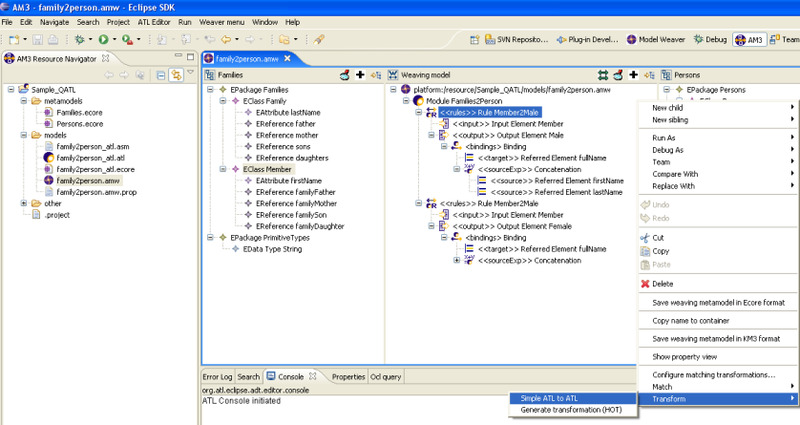 Weaving models may be used in several application scenarios, such as metamodel comparison, traceability, model matching, model annotation, interoperability. This is because it is often necessary to establish links between elements of different models. These use cases are implemented using AMW. AMW supports such a variety of application scenarios because it has an adaptive interface that handles different metamodel extensions (AMW is fully implemented using the reflective API of EMF). The plug-in also provides a set of extensions points that enables to add new functionalities when necessary. A set of use case is found in the Use Cases page. More information can also be found in the AMW FAQ. The AMW Examples HowTo contains additional information about the examples available for download in the AMW project web site. SAC07 Del Fabro, MD, and Valduriez, P :Semi-automatic Model Integration using Matching Transformations and Weaving Models . In: The 22th Annual ACM SAC, MT 2007 - Model Transformation Track, Seoul (Korea), 2007. ODBASE2006 Didonet Del Fabro, M, Bézivin, J, and Valduriez, P : Model-driven Tool Interoperability: an Application in Bug Tracking. In: ODBASE'06(OTM Federated Conferences). 2006. BDA2005 Didonet Del Fabro, M, Bézivin, J, Jouault, F, and Valduriez, P : Applying Generic Model Management to Data Mapping. In: Proceedings of Bases de Données Avancées (BDA05), 17-20 october 2005, Saint-Malo, France. The AMW project provides an Eclipse plugin to create weaving models and to compose metamodel extensions. The plugin can be downloaded in the AMW Download Page. A set of application scenarios is available at AMW Examples. There are examples of weaving models, metamodel extensions, weaving models generated automatically through matching transformations, AM3 Ant Tasks, higher-order transformations that take a weaving model and that produce model transformations, etc. These examples are sorted in different categories.